Deep Value investing is characterized by the purchase of securities in companies with extremely low valuations. Frequently, these companies are particularly out-of-favor or in industries that are out-of-favor. Numerous academic studies have demonstrated the existence of a value premium. The value premium refers to the empirical finding that stocks with low valuations tend to outperform the market average, while stocks with high valuations (growth stocks, or glamour stocks) tend to underperform the market average. 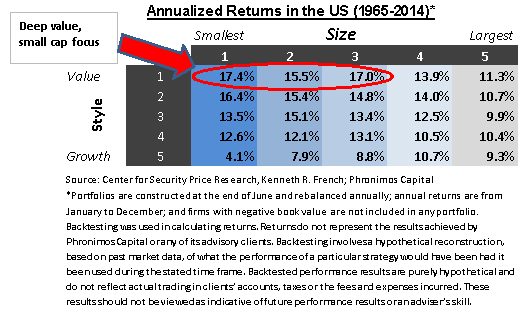 Furthermore, the value premium is larger (or more robust) for small stocks. For instance, over the past 50 years, a hypothetical portfolio of the deepest value, smallest capitalization companies rebalanced annually, would have grown at a compounded annual growth rate (CAGR) of 17.4% per year, roughly 7.5% higher than the S&P 500 CAGR of 9.9%. The excess 7.5%* over 50 years would have made a $29 million difference on a $10,000 investment! 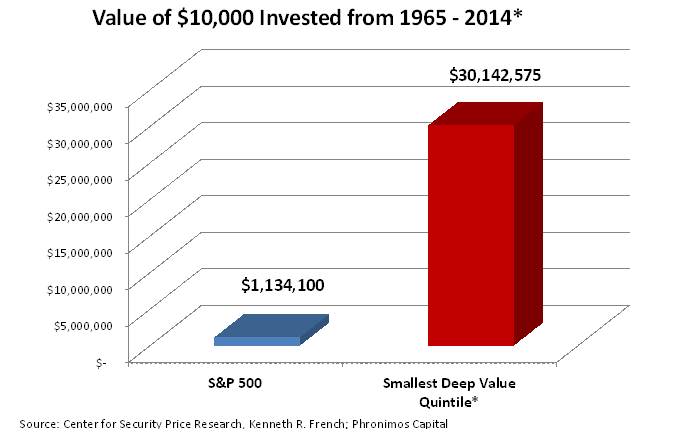 A hypothetical portfolio starting with $10,000 allocated to the smallest, deepest value quintile of US stocks in 1965 would have grown at 17.4% per year to $30 million by the end of 2014 as opposed to $1 million had the investment compounded at 9.9% in the large cap dominated S&P 500. More recent studies show that the value premium is better captured by an enterprise value based valuation metric. An enterprise multiple takes in to account a firm's net debt load and is therefore less likely to yield highly leveraged companies that may appear to be cheap on a book value basis, but not after one accounts for debt, preferred stock and minority interest. 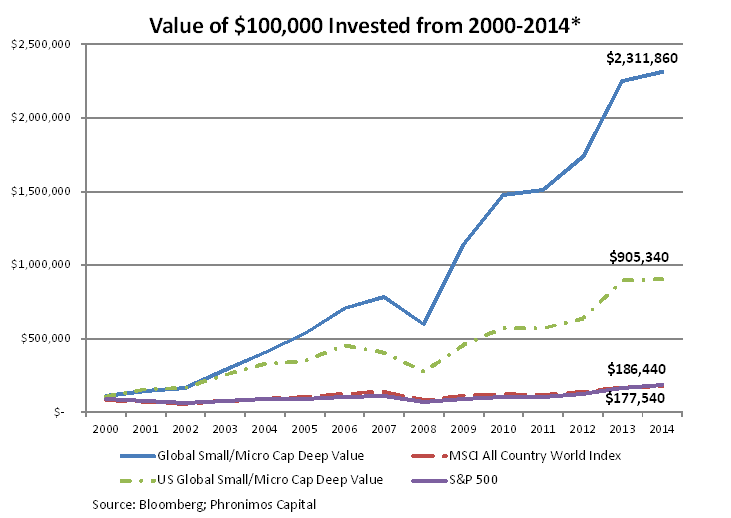 So why aren't there more deep value investors? The value premium is most pronounced amongst the smallest and most illiquid companies. Successful investment managers, will over time, tend to attract so much capital that the economics of investing in illiquid segments of the market with limited capacity to absorb these large sums of money, becomes infeasible. Value stocks frequently underperform the market and growth stocks. For instance, we observe that between 1970 and 2014, the smallest, deepest value quintile of US stocks underperformed the S&P 500 roughly 40% of the time. In addition, value stock underperformance can extend for many years (as evidenced by a 5 year stretch from 1969-1974.) We would note, however, that it is not the frequency of the underperformance or outperformance that matters most, but rather the magnitude of the under or outperformance. Despite underperforming approximately 40% of the time, the average outperformance of the smallest, deepest value quintile over the course of the 50 year period was approximately 7.5% per year on average. Nevertheless, although one may be aware that the potential for superior returns from a deep value strategy requires a long investment horizon, most investment professionals and asset allocators are evaluated over much shorter periods of time (i.e. annually.) Periods of significant underperformance can create career risk for these gatekeepers and hence they are unwilling to consider contrarian strategies (regardless of its long term merits). This phenomenon is not unique to the financial services industry, and is epitomized by the traditional axiom of purchasing agents that "nobody ever got fired for buying IBM equipment". The result is that many purchasing departments (or asset allocators) buy products or services that they know to be technically inferior because upper management is more likely to recognize the popular brand. Deep value investing, by its very nature, requires the purchase of securities that are unappealing or out-of-favor. Even if, as Seth Klarman put it, the entire country became security analysts, memorized Benjamin Graham’s Intelligent Investor and regularly attended Warren Buffett’s annual shareholder meetings, most people would still find themselves irresistibly drawn to hot IPOs and investment fads. "In short, even the best trained investors would make the same mistakes investors have been making forever, and for the same immutable reason – that they cannot help it.” Humans behave irrationally and are prone to cognitive biases that can lead to sub-optimal and sometimes catastrophic decisions. Experienced investment advisors and practitioners are not immune to these biases and are often slow to change their minds, even in the face of compelling evidence. *Backtesting was used in calculating returns. Returns do not represent the results achieved by Phronimos Capital or any of its advisory clients. Backtesting involves a hypothetical reconstruction, based on past market data, of what the performance of a particular strategy would have been had it been used during the stated time frame. Backtested performance results are purely hypothetical and do not reflect actual trading in clients’ accounts, taxes or the expenses incurred. These results should not be viewed as indicative of an adviser’s skill and do not reflect the performance results that were achieved by any investor. *No current or prospective client should assume that the future performance of any specific investment or strategy will be profitable or equal to past performance levels. All investment strategies have the potential for profit or loss. Changes in investment strategies, contributions or withdrawals, and economic conditions may materially alter the performance of your portfolio. Different types of investments involve varying degrees of risk, and there can be no assurance that any specific investment or strategy will be suitable or profitable for a client's portfolio. *Historical performance results for investment indexes and/or categories, generally do not reflect the deduction of transaction and/or custodial charges or the deduction of an investment-management fee, the incurrence of which would have the effect of decreasing historical performance results. There are no assurances that a portfolio will match or outperform any particular benchmark.